The Si Cuba Festival is currently being celebrated in New York City and will run through June. It features Cuban visual art, film, music, and a generous offering of dance. 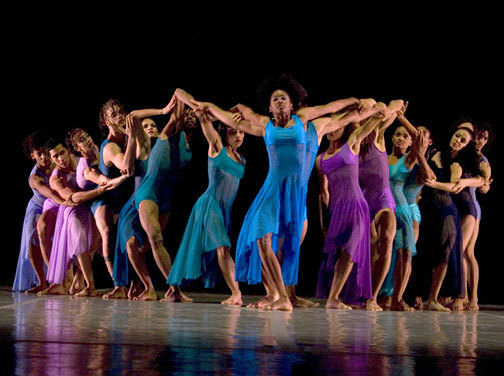 Companies performing here include Ballet Folklorico Cutumba, Ballet Nacional de Cuba, and Danza Contemporanea de Cuba. Danza Contemporanea’s program at the Joyce opened with Sulkary, a 1971 piece for three men and three women, choreographed by Eduardo Rivero. Paying tribute to the African roots of Cuban culture, it’s performed to traditional music which opens with spare chants and drumbeats. Dressed in flesh colored leotards ornamented with shells and beads, the women strike poses that we’ve seen in ancient artwork. On the beat of the drum, with the smallest most unexpected isolation, they transform from one pose to another. They often move with their arms held up, elbows bent, wrists flexed, palms facing the ceiling. Then their arms wave like the wings of birds and their torsos ripple. Much of their movement is expansive and peaceful. The men arrive carrying staffs. They are aggressive, claiming their territory, glaring at the women with wild eyed intensity, tapping the butts of their staffs against the stage floor as if to stake their claim. They carry themselves as Gods and not as slaves. The couples come together, striking beautiful primitive poses, ending with the women up high on the men’s shoulders, as if together they make some kind of gorgeous exotic being. Pedro Ruiz’s Horizonte was a very pretty tribute to the tropical colors, breezes, light and rhythms of the waters surrounding Cuba. 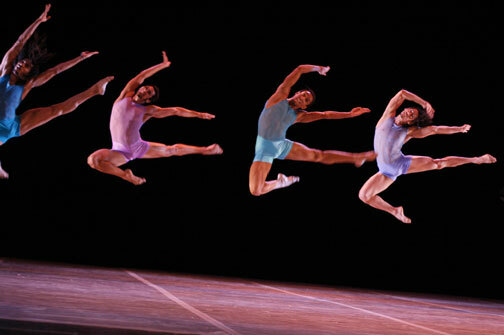 The dancers are dressed in diaphanous costumes in a spectrum of pastel blues and purples. The movement is joyous and the dancers are happy and smiling. 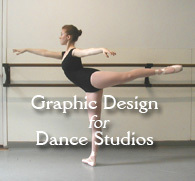 The choreography is full of big leaps and high dramatic lifts. In one especially beautiful passage, the men roll across the stage like the waves on the ocean, and somehow leap high from their prone position on the floor, just like a spray of ocean water or a flying fish. Much was said about this piece in the New York Times and in Dance Magazine, suggesting that it was too tame and cliche. I will confess to having felt that way for the first few moments of the dance, but as it progressed I became completely drawn in. I have seen a lot of Mr. Ruiz’s work, but for me this piece stood out as one of his best. I felt that it suited the company so well, as if he’d taken the time to know the dancers personally and to play to their strengths. As to whether or not it’s a singularly Cuban work, before this night my experience with Cuban dance began and ended with Carlos Acosta’s autobiography No Way Home, so I’m in no position to comment. But I did feel that there was something very special and lovely about this dance. Some in the audience commented that they could practically feel the ocean breezes and smell the clean air. Demo-N/Crazy (which Artistic Director Miguel A. Iglesias Ferrer pronounced “Demon Crazy”) opens to silence and then the sound of sawing strings. The women are bare chested and there is a feeling of innocence — the calm before the storm. The men and women embrace. But this atmosphere becomes shattered when one of the men breaks free of one of the women and leaves her sitting alone on the stage. She sings a melancholy song as she slowly crosses the stage and moves on. From this point on, a frenzy of energy and noise is unleashed. One passage is danced to the song Ne Me Quitte Pas in which two sets of men battle each other. Things become quite brutal. We are wondering if they are lovers and this is the end of their relationship. But Ferrer later told us that it had nothing to do with relationships or sexuality, but instead it was more a statement about the chaos and aggression that characterize so much of today’s world, locally and on an international stage. From that perspective, the piece really worked as each individual escalated in battle, refused gestures of conciliation, and grew ever more violent. The piece ends with each dancer in a headstand, which they hold for an awfully long time. It seemed to me to reflect that the world is currently in a state of being upside down, and while we all hold out hopes of a better future, at the rate that we’re going there isn’t much on the horizon to give external encouragement. It has to be found within. If Demo-N/Crazy demonstrated nothing else, it proved that the dancers in this company are world class technicians who have managed to accomplish the feat of presenting soulful dance without being encumbered by their own virtuosity. No matter how uplifting the performance and the Dance Chat, I left the Joyce Theater feeling just a little bit sad. The evening drove home for me the fact that whenever there is a standoff between two entities, no matter who was the aggressor, who was at fault, or what happened, both parties often wind up paying a huge price. It makes me sad to consider everything that America and Americans have lost because of what Fernando Garcia Leon (Danza Contemporanea’s Public Relations Director) so poetically referred to as “an artistic dialogue hampered by US – Cuban politics”. Mr. Leon speaks as beautifully as the company dances and I felt that his words summed up the situation. He said that in cultural and geographic terms, Cuba and the United States have a close relationship, even in spite of the political turmoil. But the current political landscape keeps both cultures disconnected from the best of what could be. I am sure that artists and audiences in both nations are looking forward to a time when the embargo ends and the artistic dialogue can flourish without restrictions. 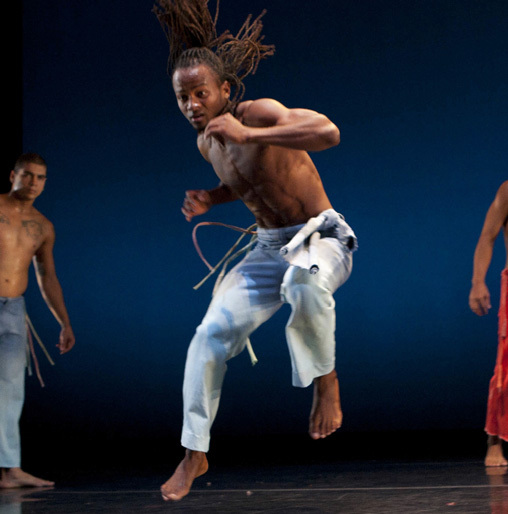 This entry was posted in Dance, Karen and tagged Danza Contemporanea de Cuba, Demo-N/Crazy, Eduardo Rivero, Fernando Garcia Leon, Horizonte, Joyce Theater, Miguel A. Iglesias Ferrer, Pedro Ruiz, Si Cuba Festival, Sulkary. Bookmark the permalink.